PLATTSBURGH, N.Y. — Elise Stefanik will always wonder how things would be different if she skipped science class. She was in the Harvard University Science Center, going to a lecture that filled one of her requirements to graduate. On her way, Stefanik spotted Mark Zuckerberg, a fellow member of the Class of 2006 with whom she was vaguely acquainted and had mutual friends. By that point, “Facemash,” the earliest iteration of what would become Facebook, was well established within Harvard’s campus community. As she walked down the hall to science class, Stefanik saw Zuckerberg trying to recruit people to come with him to California that summer to develop the project. By that point, there were only five or six students who had showed up. “I remember looking and saying, ‘Oh, that’s interesting. That’s an interesting project.’ And I went on to my class,” Stefanik, now the Republican candidate in New York’s 21st congressional district, told Business Insider in a recent interview. “I’m sure I will be telling my future kids this someday when they ask me, ‘Mum, why didn’t you invest in Facebook? '” she said. A decade later, Stefanik isn’t a Silicon Valley millionaire. 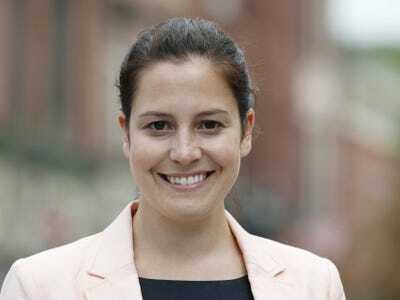 But she is forging her own historic path in the American political landscape through New York’s “North Country.” On Tuesday, the 30-year-old Stefanik will likely become the youngest woman ever elected to Congress. A recent Siena College poll put her up 18 points on her Democratic challenger, Aaron Woolf. On the trail in a sprawling district that spans from Saratoga Springs in the south, to Watertown in the west, and the Canadian border in the north, Stefanik is a rock star. Her appearances attract supporters who traditionally don’t vote Republican — young voters and women. The GOP’s congressional leadership has already taken a keen interest in Stefanik — House Speaker John Boehner and Majority Leader Kevin McCarthy have both fundraised for her. And last week, four leading Republicans in Congress came to the district to join her as she was endorsed by the US Chamber of Commerce. Party leaders clearly believe Stefanik is important to the future of the GOP. “For us, nationally, I think it’s really important for my party and for the country to have voices from all over the country — new, young, vibrant voices,” said Rep. Greg Walden (R-Oregon), the chair of the National Republican Congressional Committee told Business Insider. 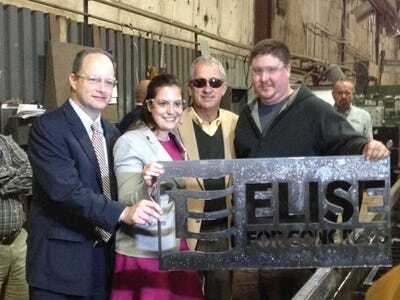 Walden was on hand for Stefanik’s Chamber endorsement last week at Jeffords Steel and Engineering in Plattsburgh. In all respects, Stefanik has this race in the bag. But it wasn’t always that way. Brett LoGiurato/Business InsiderElise Stefanik speaks to supporters at a get-out-the-vote rally at her campaign headquarters in Plattsburgh, N.Y.
Last August, Mark Westcott got a call out of the blue. Elise Stefanik, on the spur of the moment, asked him to meet up at the Starbucks off Exit 19 on Interstate-87. Westcott, who lives in the town of Queensbury, holds considerable clout within the district. He is an elected official, the Supervisor-at-Large of the town of Queensbury. He’s also a member of the town’s Rotary Club and attends the First Presbyterian Church in nearby Glens Falls. He is also one of those people who “knows everybody” within the radius of a few close-knit towns. Stefanik wanted to talk to him about running for Congress. Westcott, a Republican, had met with other prospective candidates who were thinking about taking on incumbent Rep. Bill Owens, a relatively popular Democrat. Westcott had lunch in July with Matt Doheny, the Republican who lost to Owens by just 2 points in 2012. At the time, Doheny told Westcott he wasn’t planning on running again. He wanted to see what Stefanik had to offer. Westcott asked her about her childhood and working for her family’s business, Premium Plywood Products, which her father founded when she was 7 years old. Westcott also asked about her time at Albany Academy for Girls, where Stefanik attended prep school. And he asked about Harvard, where she attended on a partial academic scholarship and worked as a fellow under Ted Sorensen, President John F. Kennedy’s former speechwriter. For Stefanik, those early days of the campaign were a struggle. She moved moved back upstate from Washington, D.C., in 2012 to work at her family’s company. And she ended up running the early stages of the campaign while working full-time at Premium Plywood, where she focused on sales in northern New York. Despite having a day job, Stefanik traversed the district, putting tens of thousands of miles on her Ford F-150 pickup truck. She made it a point to meet with others influential locals like Westcott; county leaders, elected officials, other people who were thinking about running for office. And she met with voters. Westcott’s wife was also impressed after meeting Stefanik. He came out as one of Stefanik’s early backers and has stayed active volunteering on the campaign as its Warren County coordinator. Westcott has hosted fundraisers and meet-and-greets, and he set up the $US25-a-person fundraiser featuring McCarthy last month at Full Moon Bar and Grill in Lake George. 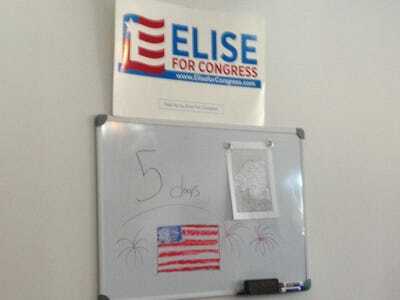 Brett LoGiurato/Business InsiderA whiteboard at one of Stefanik’s campaign offices counts down the days. Stefanik’s first foray into politics came at Albany Academy for Girls, where she built a campaign for secretary of student council in sixth grade on a simple premise — bringing in a snack machine for the school. She won that election and went to work on getting the snack machine. With a slight chuckle, Stefanik said her success delivering on that promise to bipartisanship and listening to the concerns of people who would be affected by its implementation. Along the way to installing the machine, Stefanik worked with Melissa DeRosa, an eighth grader at the time who would go on to become New York Gov. Andrew Cuomo’s communications director, to negotiate the deal. The snack machine became a revenue stream for the school, which got to keep a percentage of sales, and it helped pay for things like dances. The campaign slogan wrote itself. “Who doesn’t like a snack machine?” Stefanik said. From an early age, Stefanik was interested in the way politics and policy intersect to affect lives. Ahead of her graduation from Harvard’s Institute of Politics, she broke from many of her peers who decided to go into the economic, finance, and consulting fields. Stefanik didn’t have a job lined up until the week before graduation. She was hired as a staff assistant in the White House under the administration of President George W. Bush. She graduated on a Thursday. The next Monday was Stefanik’s first day in Washington. She was supposed to have a routine meeting with Karl Zinsmeister, then the incoming head of the president’s domestic policy council. Zinsmeister, as it turned out, was looking for a staffer to help him transition. They both had ties to upstate New York — Zinsmeister is from Cazenovia — and he hired her on the spot. Stefanik still hadn’t turned 22. Stefanik spent a year with the domestic policy council before joining the chief of staff’s office. After the White House, she stayed in Washington, working at the Foreign Policy Initiative and co-founding Defending Defence, a group of think tanks opposing the automatic, across-the-board cuts of sequestration that came from the 2011 deal to increase the nation’s debt ceiling. She hopped on the campaign trail in 2012, serving as the policy director for former Minnesota Gov. Tim Pawlenty’s brief presidential campaign. Later in the 2012 campaign, she served as the policy director for the Republican National Committee ahead of the party’s convention in Tampa. After the RNC, the Romney campaign hired her to lead debate preparations for vice presidential nominee Paul Ryan. Stefanik has already taken a lot of different paths to get to this point, but she thinks her set of experiences, plus the contacts she has made in Washington, will be important in making her a successful representative. Brett LoGiurato/Business InsiderElise Stefanik was presented with a piece of steel with her campaign logo inscribed in it during a campaign stop. The dynamics of Stefanik’s race changed completely in the first two months of the year. Owens, the Democratic incumbent, suddenly dropped out of the race in January. Afterwards, Doheny, who had previously told Westcott he wouldn’t run, decided to jump back in. After expecting a tough battle against an incumbent, Stefanik suddenly faced a potentially much more challenging primary in June followed by what seemed to be an open general election. Once Owens bowed out, Republican leaders began taking an interest in Stefanik and her race. Romney endorsed her in May. Ryan stumped with her early the next month. The Karl Rove-backed super PAC American Crossroads spent more than $US770,000 during the primary — all of it, according to the Center for Responsive Politics, attacking Doheny. Stefanik overwhelmed Doheny in the Republican primary, winning more than 60% of the vote. Republican leaders have kept up their interest. In September, Boehner visited Glens Falls for a fundraiser on her behalf. A couple of weeks later, she was tapped to deliver the weekly Republican address, the counterpoint to President Barack Obama’s weekly remarks to the public. Last week, at Jeffords Steel in Plattsburgh, four high-profile GOP members of Congress — Reps. Chris Collins (R-NY), Lynn Westmoreland (R-Georgia), Tom Price (R-Georgia), and Walden — walked alongside Stefanik as she toured the facility and was presented with a plasma-cut piece of steel inscribed with her campaign logo. “You’ll be the only member of Congress with a plasma-cut piece of steel with your name on it!” Westmoreland told her. For Stefanik, there is a delicate balance between expressing frustration over the way Washington is being run and touting her relationship with Republican leaders and the benefits it could bring to the district. “Members of Congress who want to get things done — they need partners who want to move the ball forward on big issues like fundamental tax reform, on regulatory reform, on putting together a replacement package for Obamacare,” Stefanik said. Stefanik credits her current lead to her persistence in the early days of her campaign. Her name, which had almost non-existent recognition a year and a half ago, has clearly penetrated throughout the district. At a Plattsburgh pizza restaurant called Bazzano’s and at Ambrosia Diner in Queensbury two hours down I-87, residents were excited about the potential of a woman named Elise Stefanik representing their district. “We need the kind of smart, experienced youth she brings,” added Jody Lawson, a retired resident of Plattsburgh who described herself as a lifelong Democrat. For Stefanik, one moment during the campaign crystallized why politics is the right path for her. She was at a roundtable with servicemen at River Hospital near Fort Drum. They talked about their difficulties in their post-service lives, struggling with post-traumatic stress disorder and thoughts and attempts of suicide. The service members discussed creative programs that provided flexibility and outside-the-box approaches toward dealing with their needs.